When it comes to modern First-Person-Shooters, the competitive multiplayer scene has been changing drastically, with shooters leaning farther towards the extremes of arcade or realistic gameplay. Classic Arena shooters like Quake Champions or Doom are making a resurgence, and realistic shooters like Squad or Insurgency are slowly becoming mainstream. Lawbreakers fits a place nowhere on the spectrum and it really stands out. At E3 this year, I got several chances to play Lawbreakers, and I only wanted to play more. Despite having the speed and twitch shooting of classic arena shooters, it maintains objective-based gameplay in a way that keeps you from focusing on just playing team-deathmatch. 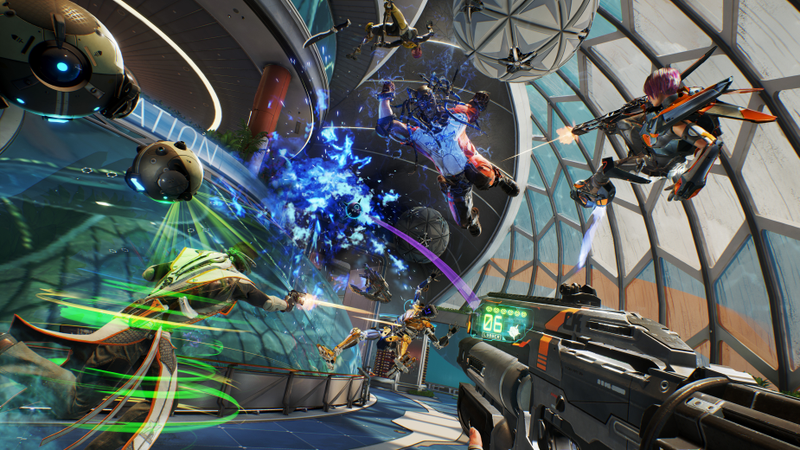 Rather than polishing their shooting mechanics as much as possible as modern arena shooters are, Lawbreakers is focusing on creating something truly unique in its gameplay that I think arena shooter fans are going to flock to. There is an intensity to the gameplay that clearly stems from its unique movement. There is a high skill ceiling which allows players to move at incredible speeds like that of games like Quake, and in addition to that the low gravity sections of each map have a surprising amount of depth in the way it lets players move. On top of jumping around in the low gravity, you can use your guns to push yourself around with the recoil. You can shoot behind yourself while running forward to propel yourself forward, so you can fly across the map towards enemies. It was really fun during my time with the game, but it would be much more interesting to see how pros can work around low-gravity zones because they would figure out all the angles at which you can jump to reach different areas based on each class, or how much propulsion you need from your gun to get to where you want to go. I played the “Blitzball” gamemode at E3 this year, and it is a blast. Its essentially capture the flag, except both teams are going for one target, a “EURO Ball” which they have to bring to their opponents base. The ball is actually voiced by Rick and Morty creator Justin Roiland as well, which seemed unnecessary but actually adds a nice charm to the mode. It was much more fun than the attrition based gameplay of traditional capture the flag modes, because most players are focusing in on one location in the middle of a low-gravity zone. The different classes in the game all function very differently, with vastly different weapons and different ways of moving. I got familiar with the “Enforcer” and “Vanguard” classes equipped with a minigun and rifle respectively. The enforcer clearly played from a farther range and was made to deal lots of burst damage with its rifle and a grenade, whereas the vanguard was meant to get in close with a minigun to enemies’ faces and a really cool melee ability. The classes don’t do much to support each other, or at least they don’t from what I’ve played, but that’s okay because in the end character choice was not about countering other players, just different play styles. That would scare away fans of games like Overwatch where teamwork is key, but fans of shooters like Quake or Call of Duty where one player can make the whole difference are going to love it in Lawbreakers. However, there was one thing that seriously worried me about the characters in the game: balance. The “Wraith” class absolutely dominated the E3 floor because it was simply better than just about every other class in Blitzball. It does high damage, moves incredibly fast, and even has a melee ability which lets it dash forward. Players playing the Wraith would immediately grab the ball, then in seconds reach the opponents base an there simply isn’t anything you can do to stop them because of how fast they move. The Wraith was just outright better than every other class. That balance issue has me worried about how the game’s meta will form. Of course, the game hasn’t even reached its closed beta yet so anything can change. I’m genuinely curious as to where the game can go, especially since its clearly trying to establish itself as the best choice in a very specific subgenre of first person shooters, the same way Overwatch has. The gameplay along with the 30 dollar pricetag says this clearly isn’t supposed to be a triple-A blockbuster, but an e-sports cashcow. The game has a closed beta opening on June 28, and an open beta on the 30 until July 3, and releases on August 8.